It is aged on the lees for at least 24 months before disgorging and no liqueur d’expédition is added, thus preserving all its original qualities and heightening the classic yeasty “crusty bread” aroma. The nose offers rich, fruity grassy notes that mingle with the bready bakery aromas, while the palate is very dry but not harsh, with good balance and length. 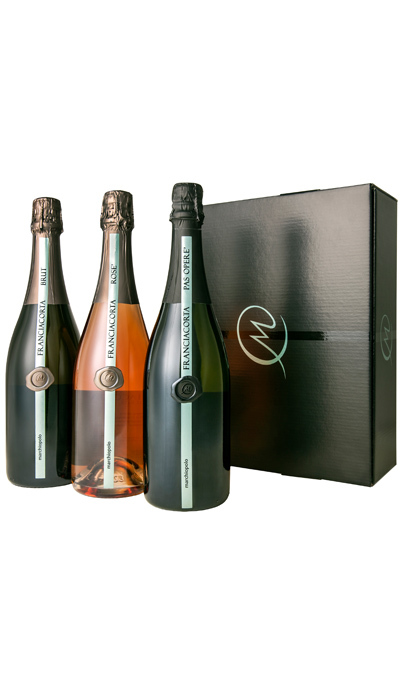 From the quintessential home of italian sparkling wines comes this brut rosé that it's aged on the lees for at least 24 months before disgorgings. The wine is a blend of 55% Pinot Noir and 45% Chardonnay, the strength of red grape and the fineness of the white together in a romantic union, for all special occasions. Fruity nose with citrus and red fruits scents. Fairly soft, but fresh and tasty.